PARIS (Reuters) - BNP Paribas (BNPP.PA), France's largest bank, returned to net profit in the third quarter and rebounded from a costly U.S. legal settlement to publish what it called a "rock solid" balance sheet, sending its shares up over 4 percent. BNP -- battling to restore investor and client confidence after a $8.9 billion fine from U.S. authorities -- reshuffled its top ranks in the quarter to tighten controls. It said veteran adviser and trouble-shooter Jean Lemierre would take the role of chairman in December. The bank settled with U.S. authorities in June, paying up over accusations that it violated U.S. sanctions against Sudan, Cuba and Iran over a 10-year period up to 2012. "The excess capital story at BNP has been derailed by litigation for the time being, but trends this quarter are encouraging," Geoff Dowes, an analyst at Societe Generale said in a note. Shares in BNP were up 3.9 percent at 50.35 euros at 11.14 a.m. EDT, outperforming a 2.5 percent firmer French market (.FCHI). BNP said on Friday its balance sheet had improved despite headwinds, reporting a core Tier 1 capital ratio under tougher Basel III rules of 10.1 percent. That was a small improvement from 10 percent at end-June, but taking into account the purchase of Polish bank BGZ and new regulatory adjustments. Under the terms of the settlement with the U.S. authorities, BNP must clear all its dollar transactions in New York. Any oil- and gas-related business landing there throughout 2015 will be forwarded to a correspondent bank for clearing. BNP Chief Financial Officer Lars Machenil said the operational details were being worked out. As a result, however -- and not helped by the drop in the oil price -- BNP's energy and commodities activities slowed in Europe. 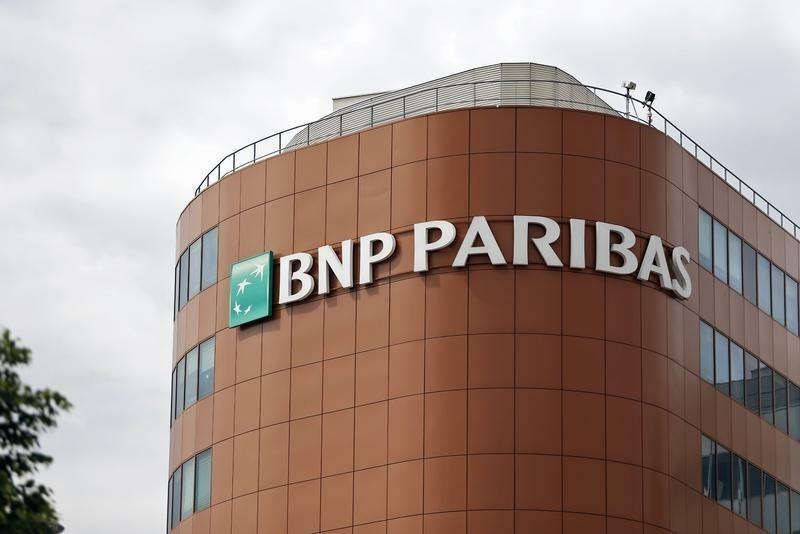 "The weakness...there is somewhat an effect specific to BNP Paribas, all the things we put in motion around the settlement," Machenil told analysts on a conference call. "But there is a generic trend, which has to do with the price of the barrel and embargoes related to Russia". The bank's quarterly net profit rose 11 percent to 1.5 billion euros ($1.89 billion), driven by lower provisions, while revenue rose 3.9 percent to 9.54 billion euros. Revenues in the investment banking business - a unit closely watched by the market following BNP's settlement with the U.S. authorities - grew by 2.9 percent in the third quarter. Alain Papiasse, head of its investment bank, is now also in charge of overseeing its U.S. business, to tighten standards there after the June fine. "CIB activities have been doing well, particularly fixed income...in rates and in forex," Machenil said in an interview with Reuters Insider after earnings were announced. Like its domestic rival Societe Generale (SOGN.PA) and other European banks, BNP is targeting new growth avenues after years of shoring up its balance sheet to meet tougher rules on risk taking after the financial crisis. This year the bank agreed to buy German online investment broker DAB in a $354 million deal with Unicredit and Poland's Bank BGZ (BGZ.WA) in a 4.5 billion zlotys ($1.39 billion) deal with Rabobank. "It's speculation. If you look at what we do in our plan, we are looking for bolt-on acquisitions ... If we find that, as a bolt-on and at a reasonable price, that's what we have to do." By bolt-on acquisitions, Machenil said he meant those that can "bring BNP an improved market share, intimacy with clients, and product knowledge". He also told analysts on Friday that European regulators took a dim view of cross-border acquisitions. BNP owns Rome-based BNL, the sixth-largest lender by assets in Italy.